faithful. 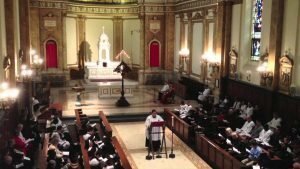 Many parishes in the Archdiocese of New York continue the tradition of praying the Liturgy of the Hours in common on these days as a way of meditating on the passion, death, and burial of the Lord while awaiting the celebration of His resurrection. The Liturgy Office frequently receives requests for booklets which can be used by parishes for the celebration of the Liturgy of the Hours during the Triduum. The ebreviary service has recently made these resources available, free of charge, on its website. The booklets may be downloaded directly from the ebreviary website and reproduced as needed by parishes.